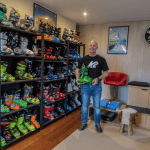 It’s safe to say that the average Aussie or Kiwi snowboarder is well and truly acquainted with Hokkaido and its offerings. These days, droves of antipodean tourists flock there year after year – crowds are actually beginning to turn some people off. As a result, many riders who travel to Japan are keen to explore destinations that have remained relatively under-the-radar up until now. Nozawa Onsen is one of the most beautiful ski resort villages in Japan. It’s famous for its abundance of hot springs that were discovered in the 8th century. The steam rises up throughout the town from the used Onsen water that escapes downhill. Nozawa Onsen has a quiet nature, offering a very peaceful and relaxing vibe. Unlike Shiga Kogen, Nozawa Onsen is made up of the one ski resort but is quite large, offering 300 hectares of terrain and a big-for-japan 1,085 meters in vertical drop. Nozawa has one of the highest annual snowfalls in the world so chances are that you’ll have a few pow days during your trip. This place is the powder-hound’s dream. 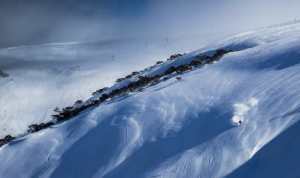 It receives over ten meters of snow each season. Nozawa Onsen is also great for families and beginners because most of the lower slopes are chilled out green runs so you’re unlikely to get lost and end up on something scary. While Nozawa is more of a powder paradise it still has a park and small half pipe for park rats. You’ll find these on the Uenotaira Trail, often with boxes at the top of the run, a jump line a little further down on the right and the pipe on the left of the trail. Nozawa Onsen is located 46km northeast of the city of Nagano and 249km northwest of Tokyo. The best option to get to Nozawa Onsen from Narita Airport is to get a shuttle from the airport straight to Nozawa. If you’re looking to get there on the cheapest budget possible you can get a bullet train from Tokyo Narita Airport to Iiyama, and catch a bus from there to the resort. Nozawa Onsen is a food lover’s haven. Apart from fantastic Japanese meals like ramen, sushi and okonomiyaki, there are western options like Italian, Mexican and a good old fashioned steak. A few of our favourite spots for lunch and dinner include Wanryu Ramen, Juntos Mexican, Akibitei Okonomiyaki, @Kai, The Craft Room, Billiken, The Corner Steakhouse and Genki Burger. Nozawa Onsen is one of the livelier Japanese resort towns. The town has several bars to keep you entertained and enough karaoke to silence your vocal chords for a week. Check out the Stay Bar, it’s always playing good tunes and has local bands come and play on weekends. A few other suggested bars and apres include Kuan, The Craft Room, Tanuki Bar, Neo,and Minato. If you really wanna party, be there on January 15th for the annual Fire Festival. The entire village comes out and drinks sake as men aged 42 and 25 battle it out in a ceremony to ward off evil spirits in front of a large wooden shrine that’s set alight at the conclusion of the festivities. Nozawa Onsen scored itself a 7/10 on the pow rating. 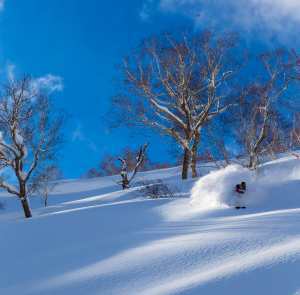 It cops heaps of powder and offers a combo of reasonably steep terrain, tree runs and a heap of wave-shaped gullies, Nozawa Onsen is definitely a resort that every powder hound needs to experience. 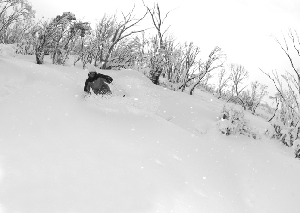 Nozawa Onsen is an absolute haven for backcountry riders. There’s endless powder behind the resort, as well as lift- assisted side country. However, you must remember that with all that powder snow the avalanche risk can be high. If you’re new to the resort it’s best to take a guided tour (in English) to safely find the best lines. 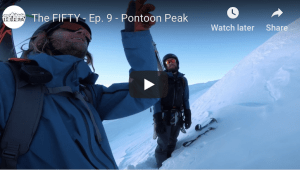 You’ll get a professional mountain guide to show you all the hidden gems for the full day, plus your beacon, shovel and probe is provided. Don’t be afraid to get into the gullies on a good day, the flow from wall to wall with knee deep powder is bound to keep a smile on your face from top to bottom. Also be prepared to come with an open mind and be ready to experience an amazing display of traditional Japanese culture at the footstep of one of the best ski resorts in Honshu.